The best RV water pressure regulator is an essential, helpful device for your recreational vehicle’s plumbing system. It can protect our valuable RV’s water system from damage due to surges happening because of high pressure. This small piece of device also keeps water pressure at safe and acceptable levels. And we all want that to prevent pipes from bursting and connections from having issues, such as leaks. But, how do you select one? That’s the major question we want to address here. Today, we’ll highlight the things to look for and top picks in the category to help you select the right one for your RV. So before deciding for an RV water pressure regulator, keep reading the following for reference and guide. Campground water pressure can be really high. Without a water pressure regulator, your water system can be damaged. That is why you need a highly recommended pressure regulator like the Renator M11-0660R. This valve is the improved version of the former M11-0660R. We find that it means serious business for having major upgrades. For one, it is lead-free, meaning no worries about safety. This model is compliant with the lead-free requirement with less than .13% lead lower than .25% NSF requirements. Renator also designed and created this with oil that prevents any friction of its internal components, making it more durable for years of service. The pressure regulator also has standard threading based on the standards of the US, making it easy to install and use. 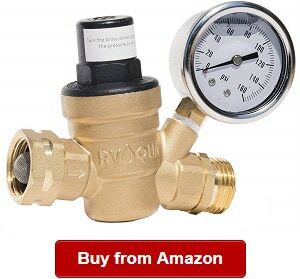 This RV water pressure regulator is also perfect for use with all water sources. It’s very useful and adjustable. Did you know that it allows up to 160-PSI adjustment. This is also easy to install because it comes with a detailed and simplified instruction manual. Regarding durability, this product is made with brass material finish, which makes it look elegant while also making it long lasting. The threading is also improved for the M11-0660R. Both the male and female are compliant with US pitch and size thread standards, making it ideal for garden tube threads and NH threads. Both the threading are tested to ensure U.S. compliant thread size and pitch. When it comes to performance and quality, we cannot ask for more. This product is one of the easiest to install and use. It also offers top performance in regulating the high water pressure going into our RVs. We recommend the M11-0660R high flow RV water pressure regulator for its durability and outstanding characteristics. On one con, this product can have leaking issues over time. 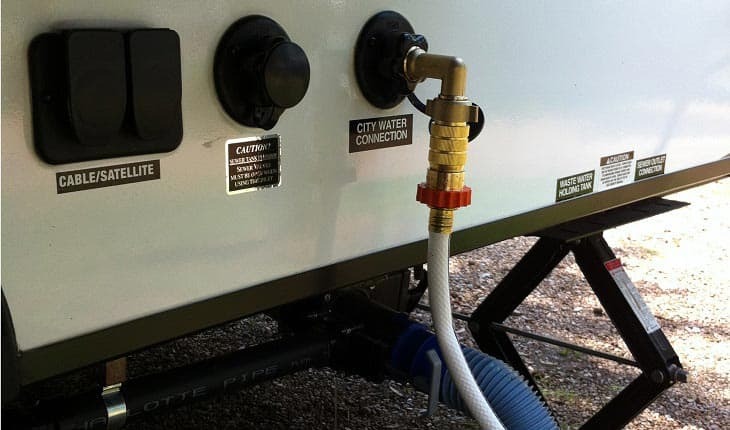 We know that the city water supply in campgrounds can have this really high pressure, which can ruin our motorhome’s plumbing system and fixtures. For this reason, we need a reliable water pressure regulator like the RVAQUA M11-45PSI. This model is adjustable for up to 160 PSI, allowing us to set it as needed to function and deliver high performance. When it comes to fitment, we should look for one that has universal compatibility, ensuring the regulator’s usage won’t be limited to several applications. 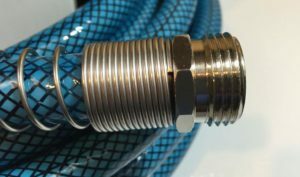 The M11-45PSI is designed to work with garden hose threads as well as NH threads, making it ideal for all US water sources. This M11-45PSI is also outstanding for coming with a dual filter, screening particles to affect water quality. Some contaminants it can filter include debris and gravel. These particles can block the valve and damage its body. The regulator can prevent it from happening, and that’s one thing we liked about the adjustable regulator. The RVAQUA M11-45PSI can be your healthy and safe choice because it is made with Class C46500 brass, which is treated by hot casting process. This model is also compliant with low lead content rules of the NSF. It contains less than the .25% requirements. That also means this product can prevent growth of bacteria and contaminant, which would otherwise affect the performance and shorten the lifespan of the valve. You can also adjust the water pressure ranging from 0 to 160 PSI using a screwdriver. Its default setting is 45PSI. It is also easy to use and has a detachable valve spool. The model has a compact size that it won’t take much space. The removable spool, on the other hand, makes it easy to clean and replace. However, we recommend getting professional help to do it if you’re not familiar on how to do it. On one negative note, it can have fitting issues. Regulating water coming from a water source, you can have peace of mind and enjoy your RV vacation or camping. While the RV is a self-contained vehicle where you live in a complete shelter and vehicle with a toilet and water system, its plumbing system can be damaged if you don’t control the pressure coming from a water source, which can be high to cause water explosion and leak. 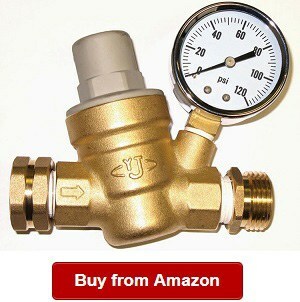 The AECOJOY Water Pressure Regulator is made with brass, making it elegant and long lasting. This material becomes the standard in many models. This product is also compliant with low lead content laws and rules, containing lower than the .25% safety level requirement of the NSF. Keeping users safe, this model does not only have a high quality but also safety features. As it is adjustable, we find it useful for many applications and water pressure coming from a source. You don’t have to worry about damaging your system because you can simply adjust this regulator to meet your PSI requirements, whether you’ll be drinking or using water from a mountain creek or campground water source. It can be adjusted from 0 to 160 PSI. The water pressure regulator is also suitable for many water types of water sources. It can be used with NH thread for a recreational vehicle or a ¾ inch water source like a garden hose thread. This product also features protection for the hose and filter, making it one of the highly recommended products in the category. It is also made with a durable gauge, keeping you informed of the water pressure instantly. One thing to note, however, the product can have leaking issues over time. Do not let your RV water filter, hose and plumbing system be damaged by high water pressure from a camping ground water source. You should use a product like the Camco 40055. It works like no other in providing your RV’s water supply system with total protection from water surges, which might lead to leaks, explosion and plumbing fixture damage. By choosing the 40055-water pressure regulator, you can have peace of mind that your system will work optimally without suffering from low or high water pressure. 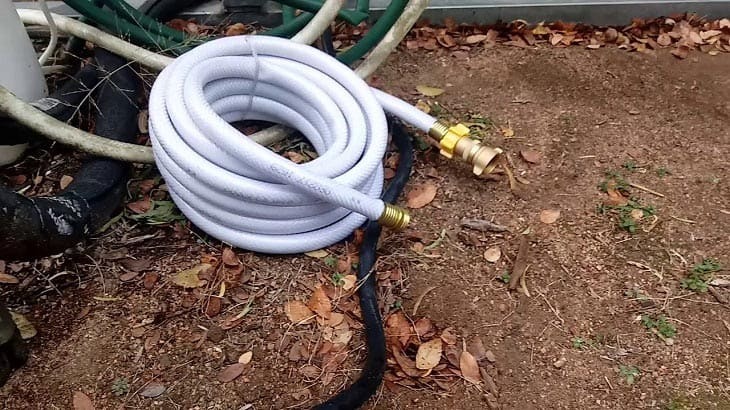 This product also works compatibly with all US water sources, including with NH threads and garden hose threads. You can depend on it for its plenty of applications and uses. But even with versatility, it can also last longer than any other water pressure regulators can because it is made with durable materials. As is it also made with brass, you can be certain of safe drinking water. Not only has that because we found out that it contained low lead content as per NSF rules and requirements. So aside from ensuring high water pressure won’t a problem, you can also be certain that your family will be healthier and safer. What does it mean? It also translates that your water will be safe for the nails, skin and hair. That is something we want to achieve no matter our age. This Camco 40055 also has a solid and durable brass construction material, making water not only safe but also your regulator long lasting. The regulator can also reduce pressure to 40-50 pounds. It is also the best RV adjustable water pressure regulator for many users. On a negative note, this product can be hard to attach to the water supply. The water pressure regulator is one of the best we found in the category. It is able to regulate water flow going to motorhomes and recreational vehicles. This model can effectively protect your vehicle’s plumbing system, hose and filter from water surges. That is why we need such as high flow water regulator. We don’t want to ruin our plumbing system and spend much on repairs and parts replacement. This Valterra can help us protect our system parts from water surges no matter where the supply is coming from. Aside from high performance and protection, the Valterra A01-1122VP is also lead-free, making water cleaner, safer and healthier. The low lead content of this pressure regulator is compliant with low lead laws in the world and the US. The Valterra high flow water regulator also works ideally with all US water sources, including NH threads and garden hose threads. By saying that, it also means that it works for a wide range of applications other than in our RVs. 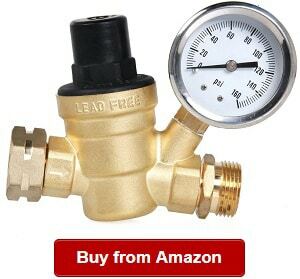 This lead-free regulator is compact and solid made with brass materials, extending the lifespan of this product. With it, you don’t need to worry about frequent replacements. It can also deliver up to 20% more flow than many standard regulators do. That is why it is our highly recommended regulators for you. Not to mention, this product is also from Valterra. It is a well-known brand in the RV world because of its commitment to high quality RV products. On the downside, the product can be hard to attach to a water supply. 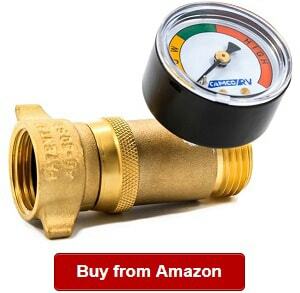 The Camco 40064 is one of the best water pressure regulators we have found so far. It works as it is meant to do by a notch higher. When we have to protect our plumbing system, filter and hose from high water pressure, we can have peace of mind that the 40064 will deliver. For one, it is from a top brand, Camco, which has been around for years providing top quality and highly functional RV products for our campers, trailers and recreational vehicles. Through the years, it has been the go-to brand for high quality recreational vehicle accessories, fixtures and other supplies. We find no problem testing the Camco 40064 because it is easy to set up and install. 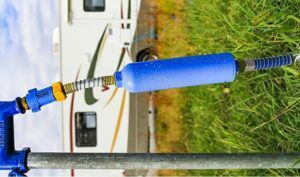 It does not only protect our RV plumbing system, hoses and filter from high water pressure coming from water sources in the campground or from a mountain creek. The adjustable regulator can also handle high flow water pressure. It is at default able to handle from 40 to 50 PSI. 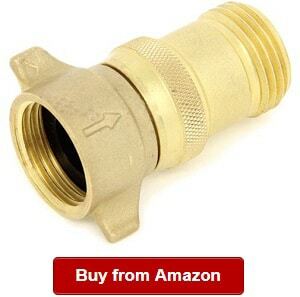 It is also compatible with all US water sources, including NH threads and garden hose threads. It also includes an easy to read gauge, showing you the regulated pressure instantly. While high water pressure gives you a great shower, you should also make sure that your plumbing would work in good condition. Or else, you will have loose connections, burst pipes and leaks. That is why you don’t want a too high water pressure. On the downside, the Camco 40064 can have leak problems with frequent use. The Esright RV adjustable water pressure regulator is lead-free, making it one of the healthiest and safest choices. It contains lower than the lead requirements set by different state laws and regulatory authorities. By choosing the Esright pressure regulator, you can be sure not only of a reliable product to work optimally but also of a safe one. The NH threads also contain oil that prevents friction in the internal components, keeping them safe and durable. 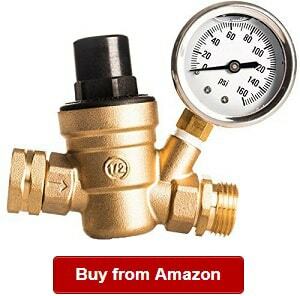 This model is also made of brass, a high quality material that becomes the standard for many best water pressure regulators. It is not only elegant and stylish but also safe and durable. So if you’re shopping around for a good water pressure regulator, you should not miss this Esright when comparing your choices. It also has adjustable PSI up to 160. You can choose it for better control over the pressure of your RV water supply. The product also works well with most thread sizes and pitch, as the maker has ensured that the threading is tested to comply with US threads. Lower than the required lead content of .25%, this product only has .16% le content. It ensures not only the safety but also the health of your family. That is one of the most important factors when choosing an RV product and accessories. Every valve has also ensured that it has passed rigorous inspections and quality checking before it is being shipped to your home. So when it comes to product quality, you should not miss the Esright water pressure regulator. On the downside, the regulator can be hard to attach to the campground’s water supply. 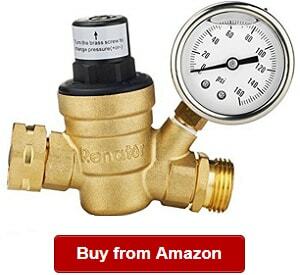 The Kanbrook Adjustable RV Water Pressure Regulator is one of our highly recommended choices in the category because it offers precise water pressure regulation. It is also one of the reasons we find it suitable to include in this review. We just don’t want to miss a good water pressure regulator for a recreational vehicle. This product also comes with two pieces of inlet screen filters that can also ensure that gravel and other particles won’t damage the valve. For peace of mind, the maker has included a hassle-free one year of warranty on the Kanbrook model. When it comes to ease of use, you don’t have to worry about anything. This water pressure regulator only needs you to connect to the water supply of the camping ground. It can also protect your hose, filter and plumbing system from damage. And that is one of the thing we need for our recreational vehicle. And if you’re finding a reliable product to provide you with such benefit, you should not miss the Kanbrook water pressure regulator to make a good decision. It is proven to last for many years because it is tested for great reliability and top performance. The product can work in extreme outdoor conditions, making it the ideal choice for RVers who want high efficiency products for their vehicles. The model is also highly adjustable from 0 and 160 PSI by just using a screwdriver, which is included in the purchase. For its inlet, it has maximum pressure capacity of 280 PSI. So if you’re looking for a high efficiency and versatile water pressure regulator, you should not miss this one on your list. On a negative note, this model is a bit pricier than other products in the same category are. The Valterra A01-1117VP can be your top choice for its high quality and durability. When looking for fixtures, accessories and gears for your recreational vehicle, these are two important features. For one, it can guarantee an extended lifespan. It can also ensure that you don’t need constant replacement for the valve regulator. It can last even in the toughest and extreme conditions. No matter the pressure and heavy use it will meet along the way, the Valterra A01-1117VP can keep up. 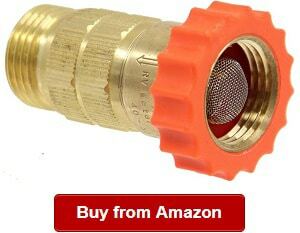 The water pressure regulator is made from high quality, lead-free brass metal. It makes the product longer lasting and accurate in delivering top performance. This model is also made with plastic coverings, which can provide it with secure and safe storage. That is another thing to look for when finding a good water pressure regulator for your recreational vehicle. No matter the high pressure of water from the supply in the camping ground, the Valterra A01-1117VP can keep up because it is also adjustable using a flathead screwdriver. You can adjust this product easily in seconds. Even beginners can do it well without any hassles. The A01-1117VP can protect your plumbing system from uncontrollable and inconsistent water pressure. The reason is that you cannot be certain of the pressure of the water supply in the campground. It might damage the hose, filter and plumbing system, which might be costly to repair and replace. The A01-1117VP comes with an easy to read gauge for easy monitoring of the water pressure. It is one of the most helpful features of this product that you might want to look into if you’re looking for precise readings all the time. On the downside, its plastic components might break over time. 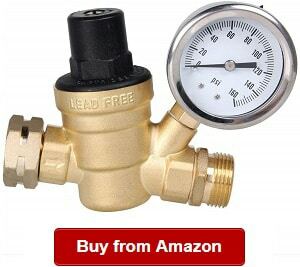 This is an adjustable brass regulator that you can rely on for the most precise water pressure regulation no matter the source. As you know, water from the source can be inconsistent. What you must avoid is the high water pressure that might damage your plumbing system, hose and filter. A product like the Camco 40058 is your dependable choice because it can regulate water pressure effectively. With it, you can have peace of mind for a memorable camping experience without any worries that your RV’s water system will be damaged with water surges. 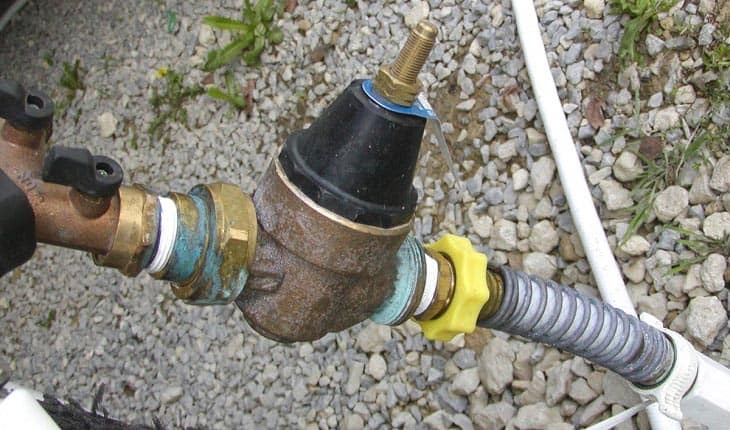 You can easily adjust the water pressure using a flathead screwdriver. Even beginners can do it easily and quickly. Just be sure to turn off the water supply before adjusting the pressure. The product is also durable for its brass material construction. You can look forward to long-lasting use with this Camco 40058. It is also made with low-lead content that complies with authority standards for consumer protection. It can prevent water surge to your boat appliances, RV water system and plumbing fixtures as well as hoses. As you may know, water pressure can be inconsistent in different water sources. Let this product protect your appliances and system from damage by regulating water pressure precisely. On the downside, it’s not recommended for pressures above 60 PSI. We know that it’s not easy to trust an online source, and we don’t blame you. But there are reasons to differentiate us from the rest. We’re transparent and honest. Our team’s main goal on this website is to provide our readers only with reliable information when choosing an RV water pressure regulator. For this reason, we have made a research and looked up for top rated products in the category. We have carefully collaborated and discussed each product’s features and functions to ensure that they deserve to be on this list. Our team has also been reviewing and using RV products and accessories for years. 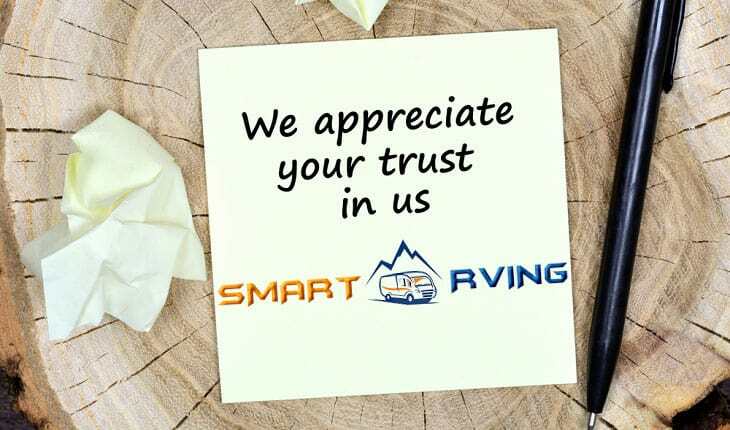 We’re confident that our firsthand experience makes us a reliable source of RV information and guide. 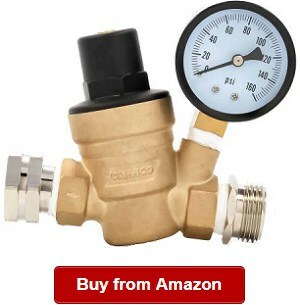 We do hope that our reviews of the best RV water pressure regulators can help you pick the right product for your needs. An RV water pressure regulator prevents water pressure surges going to your recreational vehicle’s plumbing system, filter and hose. It is an essential part of your water system. One can make your camping experience more memorable because it can get rid of worries about water connection problems, leaks and explosions. As you may know, water pressure from a campground can be high, sending very high water pressure to your RV. This small but useful tool can keep the PSI of the water pressure at a safe level. It becomes more important especially when the water supply source has no pressure regulation. It works by giving you more control over the water flow and pressure into your recreational vehicle. The piece of equipment is easy to use and adjust. In fact, you can just use a screwdriver in adjusting the water flow and pressure. At the very least, the water pressure regulator works by limiting excessive water pressure to a constant outlet pressure by modulating their opening area so that the water pressure coming will be within safe and acceptable limits. 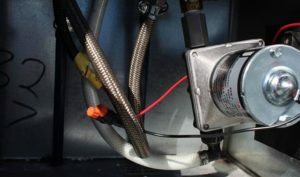 The RV water pressure regulator will activate when the water starts traveling through the end of regulator’s inlet end and just around the flow area’s fixed seat. The water will then enter a cylinder attached to a larger diaphragm close to the end of the outlet. The pressure will then act on the diaphragm located inside the water pressure regulator, trying to close the area for the flow. The area will just close enough in order to keep the set flow and pressure. 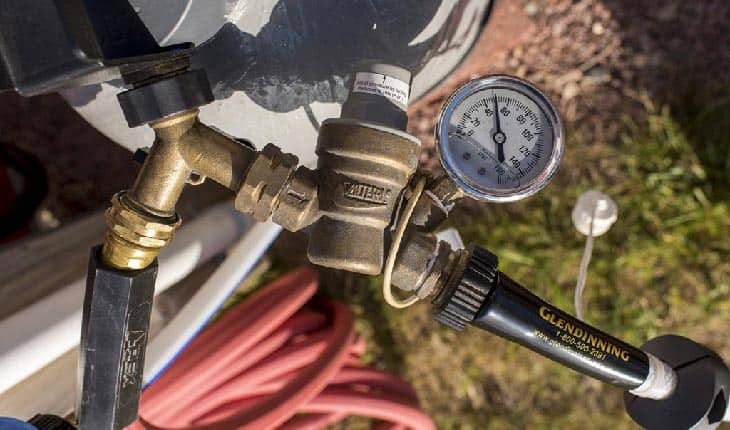 There are different types of RV water pressure regulators that you can choose from, and some of them include those we featured here. Just to give you an idea on the types of these regulators, keep reading in the following section. It is an affordable water pressure regulator made to restrict pressure from 40 to 45 PSI. However, this type of regulator does not let you adjust the water pressure. What they do is to restrict water flow and reduce water pressure. They can help in preventing weak water flow in the kitchen and bathroom, too. They’re more expensive, but they’re not also adjustable. But then, they have a higher flow rate, which can improve the water flow in the sink and shower. They come with a gauge for effectively monitoring water pressure. These types of more expensive than the rest are. Many of them let you adjust to increase or reduce water pressure by using a screwdriver that usually comes in every purchase. It does provide your RV freshwater system with protection, serving as insurance for your RV. There are many benefits to using it in your plumbing system. At the very least, you can’t be certain of the water pressure level from the source. So without knowing it, you might risk your plumbing system. 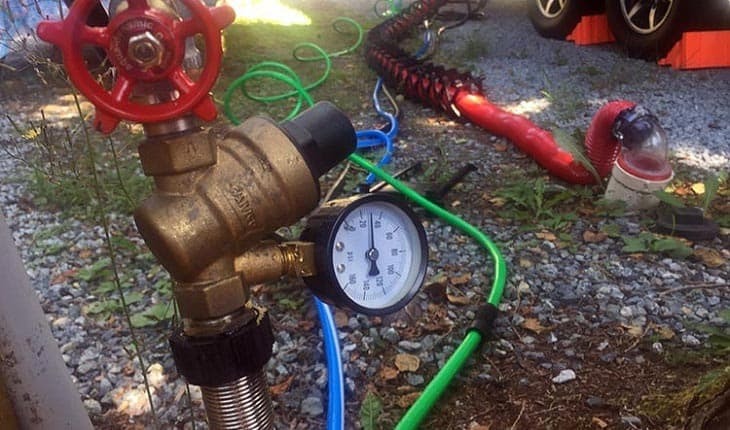 Without a pressure regulator, your freshwater pipes might burst that can lead to major damage to your recreational vehicle if the leak isn’t detected. Using one in your RV, you can be sure that you don’t have to spend on plumbing replacements and repairs from time to time. That said you don’t need to spend a huge part of your budget on such repairs and parts replacement. By having a water pressure regulator, you can ensure meeting the recommended water pressure for RV. You don’t have to worry about any leaks, connection problems and bursting in your plumbing systems. You can use the regulator to adjust the water pressure of the water going into your water system. Gravel and other elements that can damage the valve can be filtered. It is one of benefits of choosing the best pressure regulators for your recreational vehicle or trailer. Another benefit of using a regulator for the water pressure is to ensure of safer and cleaner water. The best of them are usually made of brass, ensuring of a durable construction. Many models now are made with lower lead content compliant with most state laws and authorities. 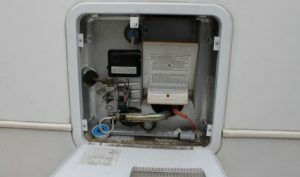 There are several things we have checked to decide on the RV regulators to list here. A few of them are the most important factors to consider when choosing an RV water pressure regulator. Let us begin in the following list of factors. There are many good brands for a water pressure regulator for your RV. Some of these include Valterra and Camco. We also featured other best brands in our list. That is why we’re hoping that you can make use of those we have listed when trying to compare your options based on the brand. We believe that choosing an RV water pressure regulator based on the brand will also help you achieve peace of mind. These brands are established and known in the field for providing top quality and durable products. They have been the go to choices when looking for RV gears and accessories. For this reason, we have chosen the best brands for regulators to help you pick one of their offerings we’ve listed in this review. There are so many kinds of regulators on the market now, so you should invest the time and effort to research and compare your options. It is one of the things to ensure that you’ll get the right one based on your specific requirements. Also, you should make sure that it fits your RV’s plumbing system. One is the in line barrel type that we’ve discussed earlier. It is not expensive and is made to control between 40-45PSI. The other one is the high flow in line barrel type we’ve talked about earlier. It is chosen for its high rsa rate, but it doesn’t let you adjust water pressure, too. The adjustable regulator, which allows making adjustment to the pressure according to your needs, is another type. So based on these types, you can start comparing and weighing your options well. Another thing we have figured out in choosing the best products in this category is the price. As there are many types of regulators, there are also different price ranges available for this product. When considering the price, we have also factored in things like pros, cons and features of the product. From these things, we’re able to find those offered at reasonable prices without compromising the quality. When shopping around for the best water pressure regulator, you should also check for the materials used in the product. Most commonly, the material used is brass. The reason is that it is solid and durable and is resistant to different types of elements. Nevertheless, you should look for one that can last longer. For one, it must resist different elements, such as rush, corrosion and lead. It must also be heavy-duty for long-term and frequent use. The material should also be able to prevent water contamination and corrosion. Based on these factors on what to look for, you can decide on the water pressure regulator for you. And when you have made up your mind, we recommend that you check the regulator regularly to ensure that it is working on top condition. Know that the regulator will also work poorly if it’s not maintained like plumbing fixtures and if it’s used for many years. Take note of when your regulator is not working optimally anymore. Some signs include significant change in water pressure and many types of inconsistencies. When that time comes, you should test the pressure if worried about its effectiveness. Nevertheless, we recommend that you also pick the RV water pressure regulator based on these factors to look for, including the price, material used, types and features. We’re hoping we have helped you select the right RV water pressure regulator based on the things we have listed here. 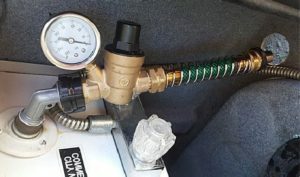 We know that you have some RV water pressure regulator questions, so we have tried answering a few of the most important ones in the following section. Q: Renator vs. RVAqua: What’s the difference? A: We did not find much difference between the two brands because both are using standard materials. Both are also offering low lead content products. These two brands are also committed to offering high quality and durable regulators. Choose one of their offers based on the price, features and other things you deem necessary when buying a regulator. 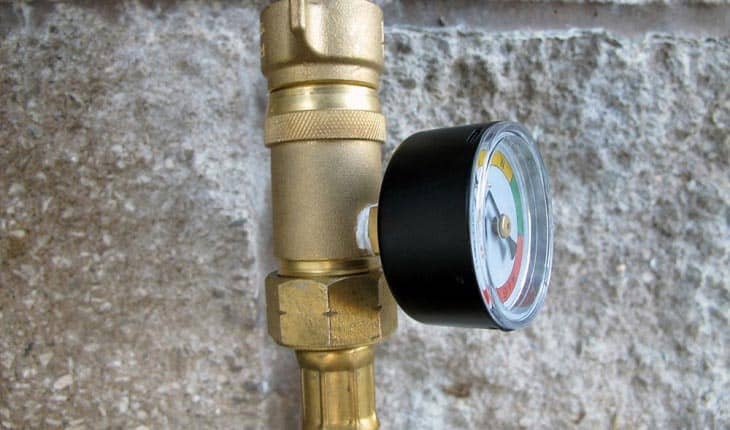 Q: Where or how do you install RV water pressure regulator? A: Installation process is easy and a breeze! In fact, you can install it in minutes. Just follow the instruction manual for specific directions. If you have to adjust the water pressure, you can do it using a flathead screwdriver, which is sometimes included in some brands available. Q: How should you use an RV water pressure regulator? A: The device is easy to use this type of regulator. You just have to connect it to the water supply easily. But for specific instructions, we recommend checking and following the instruction manual of a specific brand like a Valterra water regulator for the best results. So, what’s the best RV water pressure regulator? We do hope you picked valuable information from today’s guide. After all, we only want the best devices, gears and tools for our precious trailer, camper, motorhome or recreational vehicle. Do you agree? Which one do you think is best? Share your thoughts. Finally, buy the right recreational vehicle water pressure regulator today! 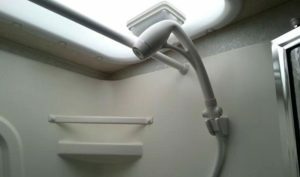 If you are looking for other RV freshwater system products, you should read these articles: best RV shower heads, best RV water filters, best RV tankless water heaters, best RV water hoses, best RV water pumps and best RV water softeners. We do hope you like them. Thanks!